The AbstractFFVVertex class provides a base class for all fermion-fermion-vector vertices in ThePEG. Definition at line 21 of file AbstractFFVVertex.h. Enum for the direction in the small angle limit. Definition at line 28 of file AbstractFFVVertex.h. Members to calculate the helicity amplitude expressions for vertices and off-shell particles. sp1 The wavefunction for the ferimon. sbar2 The wavefunction for the antifermion. vec3 The wavefunction for the vector. 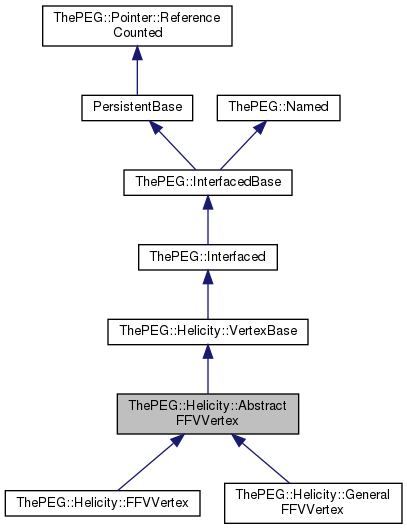 Implemented in ThePEG::Helicity::FFVVertex, and ThePEG::Helicity::GeneralFFVVertex. Evaluate the off-shell barred spinor coming from the vertex. iopt Option of the shape of the Breit-Wigner for the off-shell barred spinor. out The ParticleData pointer for the off-shell barred spinor. Evaluate the off-shell vector coming from the vertex. iopt Option of the shape of the Breit-Wigner for the off-shell vector. out The ParticleData pointer for the off-shell vector. Evaluate the off-shell spinor coming from the vertex. iopt Option of the shape of the Breit-Wigner for the off-shell spinor. out The ParticleData pointer for the off-shell spinor. Special members for off-shell fermion wavefunctions with massless gauge bosons at small angles in the small angle limit for numerical accuracy. Small angle approx for an off-shell spinor. The standard Init function used to initialize the interfaces. Called exactly once for each class by the class description system before the main function starts or when this class is dynamically loaded. The assignment operator is private and must never be called. In fact, it should not even be implemented.